Thomas Cranmer was a leading figure of the English Reformation, which was the religious movement that led to the establishment of Protestantism in England, and became the first Protestant archbishop of Canterbury. He was born on 2nd July 1489 at Aslockton, in Nottinghamshire, the son of Thomas Cranmer, who was a village squire, and his wife Agnes. He attended Cambridge University from the age of fourteen and became a fellow of Jesus College. In 1526 he received the degree of Doctor of Divinity from the University, where he had been ordained to the priesthood by 1520, and was both a lecturer in divinity (at Jesus College) and a public examiner in divinity. Cranmer came to the attention of King Henry VIII in 1529, when he met with the king's advisers concerning Henry's divorce proceedings against Catherine of Aragon. Henry's wish to divorce Catherine conflicted with doctrines of the Roman Catholic Church. Cranmer suggested that the monarch need not wait for annulment at Rome of this marriage, but might refer the question of the legality of the marriage to theologians at the universities for judgment rather than to the pope. Cranmer shortly thereafter was appointed archdeacon of Taunton, made a royal chaplain, and given a post in the household of Sir Thomas Boleyn, Earl of Wiltshire and father of Anne Boleyn, the English noblewoman who was to become Henry's second wife. In 1530 Cranmer accompanied Sir Thomas on an embassy mission to Rome, where he had been sent by the king to explain his request for annulment of his marriage to Catherine. Cranmer returned to England the same year, but in 1532 he was abroad again as Henry's ambassador to the court of Charles V, Holy Roman emperor, where he remained until after Henry nominated him to the archbishopric of Canterbury, which had become vacant. Cranmer was reluctant to return to England, for while in Germany in 1532 he had married a niece of the Lutheran theologian Andreas Osiander. This was an age when the English clergy was celibate, and he would have to conceal his marriage if he were to become archbishop. However, papal bulls soon arrived confirming the nomination, and Cranmer was consecrated archbishop of Canterbury on 30th. March, 1533. Cranmer was quick to fulfil the desires of the king. On 23rd. May he declared that the marriage of Henry and Catherine had been invalid from the first, and within five days he pronounced legal the marriage of Henry and Anne Boleyn, which had been performed secretly the preceding January. 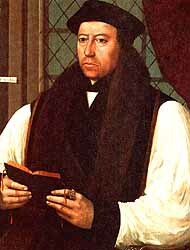 Cranmer served Henry similarly in subsequent proceedings against Anne herself and in the later matrimonial affairs of the king. In return for his services, he was made the highest ecclesiastical authority in England. He granted dispensations, consecrated bishops, issued bulls, and gradually exercised many of the prerogatives traditionally reserved to the pope. Cranmer's policies more than ever identified him with the Reformation in England. He forswore allegiance to the pope, directed erasure of the pope's name from every prayer book, and pronounced the king of England head of the English church. He encouraged distribution of Coverdale's English translation of the Bible that had been introduced in 1535, and he took the lead in revising the creed and liturgy of the church. In 1538 Cranmer carried out Henry's orders for the desecration of the shrine of Thomas à Becket in Canterbury Cathedral and for the abolition of many festivals of the Roman Catholic church. He endeavoured to secure a union of the Church of England with the Lutheran church of Germany and invited to England a number of Protestant refugees, including the Italian reformers Peter Martyr and Bernardino Ochino. In 1547, when Henry VIII lay dying, Cranmer was at his side. The king's will named the prelate one of the regents of Edward VI, the young king of England, and Cranmer proceeded to carry out the religious reforms begun in the previous reign. He compiled the two prayer books of Edward VI, the first of which was sanctioned in 1549, the second in 1552, and wrote in whole or in part the original 42 articles of religion (the doctrinal statements of the Church of England), which later were reduced in number to become the Thirty-nine Articles. Cranmer had pledged himself to carry out the will of Henry VIII, by which the right of succession fell to Mary Tudor, Henry's daughter by Catherine of Aragon, on the death of Edward VI. In 1553, however, Cranmer acceded to the deathbed request of Edward to support the transfer of the crown to Lady Jane Grey, great-granddaughter of Henry VII. Lady Jane was queen for nine days, after which Mary Tudor came to the English throne. On the accession of Mary, a Catholic, Cranmer was reprimanded for his perfidy and confined to his palace at Lambeth. On 14th. September, 1553, he was arrested and confined in the Tower of London. He was condemned to death for treason, but the order of the secular court was not carried out. Instead he was held for trial as a heretic by a clerical court after Parliament had re-established papal jurisdiction. In March 1554 Cranmer was removed to Oxford and confined in a common prison. There he was subjected to almost constant examination and exhortation. He made no fewer than seven recantations of his earlier promulgated beliefs, declaring that he believed firmly in the articles of the Roman Catholic church and that his writings were contrary to the word of God. Nevertheless, he was publicly degraded from his archbishopric, excommunicated, and finally condemned by a secular court to death by burning at the stake. Just before he died, on 21st. March, 1556, he repudiated all his recantations, and exposed to the flames the right hand that had signed them.